I’m continuing to work on the Grunow 5-U chassis which is on my bench. It’s within sight of the finish line, although there are still a number of finishing touches to do. I generally keep bench time to under 4 weeks unless there are more serious issues with a radio. Please check out some of the past segments to catch up on the work done so far. 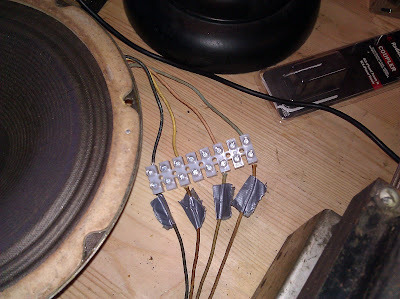 After part 4, the radio’s passive components had all been replaced to spec, the volume and band switches cleaned up, and a safety isolated iPod input was attached. Now, for some general housekeeping, and then we’ll fire the radio up for the first time. Now we’ve gone through the entire radio chassis and can be reasonably sure it won’t catch on fire when powered on for the first time. The first power-up is always an exciting moment, to see whether weeks of anticipation have been successful or not. I perform the first power-up in a few stages. First, with all tubes removed, to verify the dial light condition and run it like this for several minutes. Then, with all tubes except the rectifier installed. This allows the tubes to all heat up and begin to glow, but without the rectifier, the high-voltage will not be active. Finally, after letting the tubes sit with their heaters glowing for about 15 minutes with no trouble, I’ll power off and reconnect the rectifier, then turn it back on. If something was going to start smoking, this is the time it would happen, as even though the B+ currents are on the order of milliamperes (mA) the high voltage means this can be a lot of power dissipated. I’ve attached a ~30′ long-wire antenna for testing purposes. Turning the dial, though, I just get a little bit of static. There’s a functional issue in one of the RF circuits at this point which I’ll be tracking down this week. However, attaching an auxiliary source to the newly added line input seems to be pretty effective. It sounds about like I’d expect an entry-level five-tube radio from the 1930s with a small speaker to sound, but it’s clear and strong. The tone control is a three-position switch with settings that roughly correspond to “voice”, “music” and “pile of mush” which I expect is an equalizer curve for music that sounds unlike what we have to offer today. Coming up, I’ll be putting the finishing touches on the radio – chassis washers, an inline fuse, and tracking down the trouble circuit in the RF stages, then an alignment. 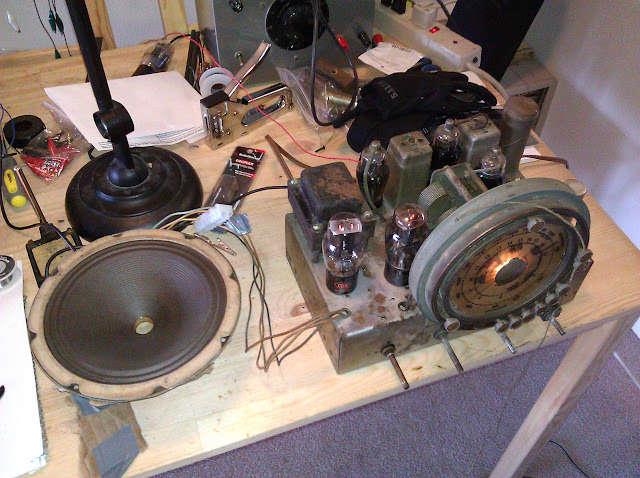 This entry was posted in Projects, Radios and Tubes, Vintage and tagged antique radio, grunow, grunow 586, grunow 589, grunow chassis 5-U, grunow radio restoration, repair, restoration, tube radio. Bookmark the permalink. Does adding safety caps work on all old tube type radios? At least the AC ones. Probably not on the AC/DC ones like Tran-Oceanic’s.